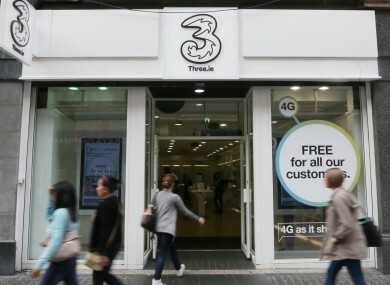 MOBILE GIANT THREE has announced that Irish customers on its all-you-can-eat data plan will not be able to avail of the same offer when roaming in the EU. This is despite the fact that the EU recently announced plans to abolish roaming charges across all member states. Under the move, first reported by the Irish Independent, Three Irish customers will still keep their all-you-can-eat offer, up to a limit of 60 gigabytes (GB) at home. The paper also reported that other operators, including Meteor, are considering a similar move. However, Three customers will not be able to use the 60GB when roaming. Instead, customers will get a ‘additional allocation of data’ to be used when abroad, and the 60GB will be used when at home. The company is also raising its monthly prices for many bill pay customers, by €5 in some cases. Three said that the changes are due to the “increased cost of doing business”. Three’s roaming data allocation will be between 1GB and 7GB depending on the plan that the customer is on. When customers go over this allocation while roaming, they will then be charged for every additional unit of data that they use while abroad. The moves comes ahead of new EU regulations that are set to come into force in the middle of June. One part of the rules was the concept of ‘roam like at home’. According to the EU Commission, travelers are meant to be able to “call, text and surf on their mobile devices when abroad in the EU for no extra charge on top of the price they pay at home”. Telecoms operators are obliged to include this provision in customer contracts. However, customers can still be charged for data usage. As part of the EU’s plan, roaming customers will be charged the wholesale rate for data, 85 cent per megabyte (MB). For example, for someone with a €40 per month contract, each 85 cent buys them 1MB of data. €40 buys about 4.8GB of data, so the customer would be entitled to a 9.6GB allowance. The Irish Independent reported that there is a loophole where a company’s data offering is classed as a ‘service benefit’, rather than a ‘core’, part of a customer contract. It said a company could do this to provide a lower data allowance to customers travelling in the EU. However, the EU Commission said in a statement this evening: “There is no loophole by which part of the domestic data allowance could be regarded as gift or side benefit and would therefore not count when traveling abroad. A spokeswoman for Three mobile said that the company’s new plans “include an allocation of data which, in addition to the call and text plan allocation, can be used at home or when roaming in the EU”. All you can eat data remains available to customers, for free and for use at home, as an additional service. The Irish Independent also reported that other companies, including Meteor and Eir, are considering following suit. A spokesman for Meteor said that the company introduced a free 1GB roaming data allowance a year ago and is examining what system to put in place by the June deadline. Email “Despite EU plan, Three mobile customers won't get 'all you can eat' data abroad”. Feedback on “Despite EU plan, Three mobile customers won't get 'all you can eat' data abroad”.